Photographers working for the newswire agencies supplied the BBC with more than 4,000 pictures of last week's funeral of Baroness Thatcher, each one arriving minutes after it was shot. There were many that will stand the test of time, one of those being the picture above by Dominic Lipinski, of the Press Association. The picture was taken from the Ornamental Gallery of St Paul's Cathedral, an area that is not accessible to the public, up above the Whispering Gallery. 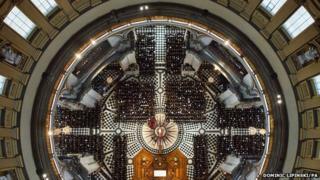 "It is almost at the very top of the cathedral dome, so it's an unusual view of the inside of St Paul's people seldom get to see," says Lipinski. The position was a pooled one, meaning that though Lipinski was working for the Press Association his photographs would also run on other wire services, such as Reuters, Associated Press and Getty Images. "As the position is so high up, it wouldn't be possible for me to lean over the edge of the gallery and take the picture with a handheld camera, as the consequences of dropping a lens or a camera from well over 200ft [60m] up above a packed St Paul's didn't bear thinking about," says Lipinski. "The only safe way to take the picture was to clamp the cameras on to the scaffolding poles so they couldn't fall, and operate them remotely." The cameras were set up on the Monday, two days before the event on 17 April, and left in place so there was no opportunity to move them. "I set up one camera with a wide-angle lens for a wide view of the whole cathedral, and another with a longer lens trained on the centre of the cathedral floor below," says Lipinski. "During the service when I was taking the photographs, I couldn't actually see anything that was going on below, as I wasn't allowed anywhere near the railing of the gallery throughout the service. I sat a few feet back looking at the feed from the cameras on a couple of laptops and could hear the amazing sounds of the choir and organ echoing up to the top of the dome, but couldn't see a thing beyond what was on the computer screens. "I heard the bells at 11am, and then waited to catch my first glimpse of Baroness Thatcher's coffin on my laptop screen." Here are a few other pictures and crops that Lipinski captured that day. You can see some more of Dominic Lipinski's work on his page on the British Press Photographer Association website, and he is also on Twitter.